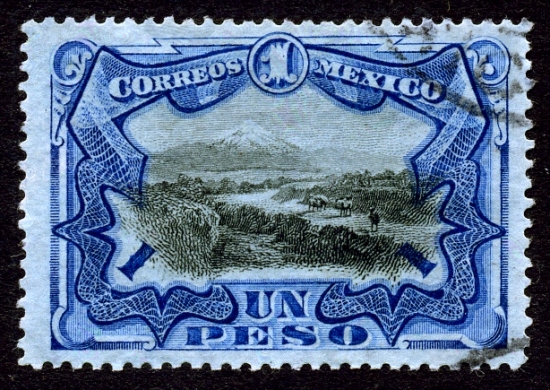 The earliest landscapes to be depicted on Mexican postage stamps were in 1899. 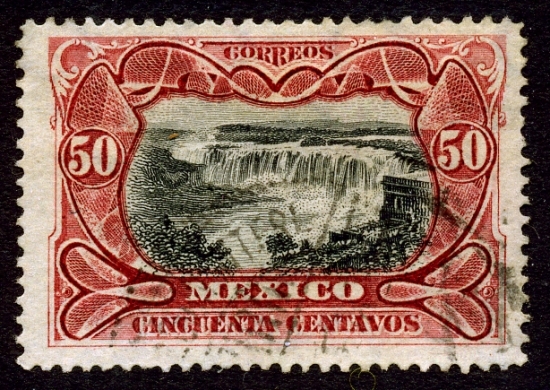 The set included these magnificent images of The Juanacatlán Falls, popularly known as the “Niagara of Mexico”, on the 50 cent stamp, and of Popocatapetl volcano on the 1 peso stamp. The Juanacatlán Falls are on the River Santiago, shortly after it leaves Lake Chapala on its way to carve the deep Oblatos Canyon on the northern edge of Mexico’s second city, Guadalajara. In 1899, these falls were considered to be the second largest waterfall in North America (in terms of volume of flow) after Niagara Falls. A bridge with 24 arches spans the falls and joins the villages of Juanacatlán and El Salto (The Waterfall). 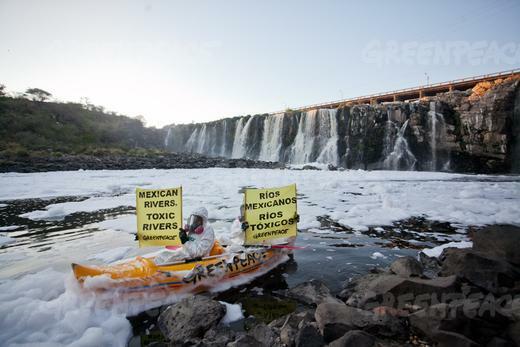 There are two major volcanoes near Mexico City. The first is the still active Popocatepetl (“Popo”), which rises to 5500 meters (18,045 feet) and is shown on the 1899 1 peso stamp. Alongside it, the dormant volcanic peak of Iztaccihuatl is 5220 m (17,126 ft) high. Both are clearly visible from Mexico City on a smog-free day. The southern suburbs of Mexico City are overshadowed by a third, smaller volcano, Ajusco, which reaches 3930 m (12,894 ft). These beautiful 1899 stamps, designed and printed in the UK, are considered to be among the gems of Mexican philately. Mexico’s many volcanoes are discussed in chapter 2 of Geo-Mexico: the geography and dynamics of modern Mexico. Water issues are examined in chapter 7, and environmental trends and issues are the subject of chapter 30.